Simple syrup is a brilliant concoction that I don’t make enough use of. I should make it more, and you should give it a try, too. Tired of stirring and stirring your iced tea, trying to get the sugar to dissolve? Frustrated by an over-baked, dry cake? Simple syrup to the rescue! And it is so simple, indeed, that there’s no need for pictures…but hey, I like pictures. Maybe you do, too. So here we go. 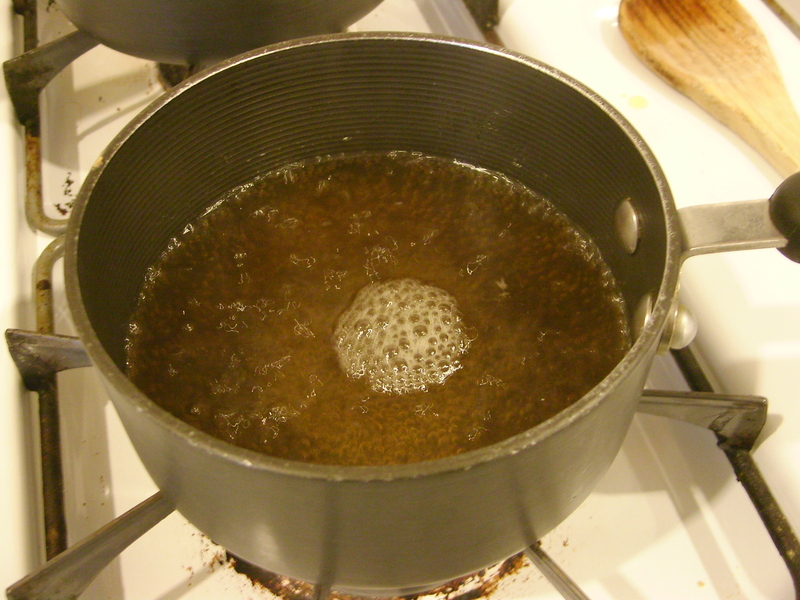 Put equal parts sugar and water into a small saucepan. I used 2/3 cup of each. Some recipes call for a 2:1 ratio of sugar to water; I haven’t tried that. If you have, please let me know how you think it compares. Don’t mind the weird lighting. The sugar + water is really all one color. Also, yours might be a different color altogether if you use white sugar (mine is unbleached). Bring to a boil. Then, swirl or stir to make sure everything’s dissolved. If it’s not, keep swirling. 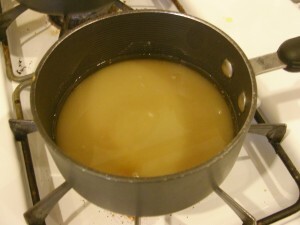 Don’t let it boil too long, though, or you’ll be on your way to making caramel (not what you want). There we go! Now, take it off the heat. If you’re going to use it to moisten a cake, you can use it right away. Dip a pastry brush in the solution, and brush it on any part of the cake that looks dry (before you add frosting). If you’re going to use it to sweeten coffee/tea or make cocktails, let it cool, then store in an air-tight container in the refrigerator. And almost as sweet as you! 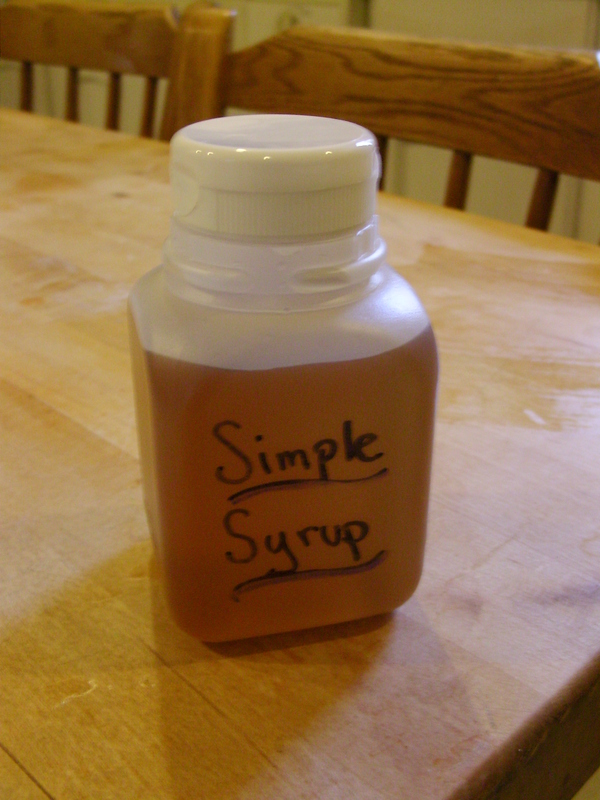 I made syrup a while back and liked it. In iced tea it just takes one stir to mix in, much faster than crystals. I will have to make it again. Thanks for the recipe and the post. Yeah, I remember when you did this! You were the one who introduced me to the idea. Great idea for cold beverages. Increasingly, I’ve seen it available at coffee shops that have multiple sweetener options, next to the sugar packets and squeeze bottle of honey.